I’m one of those self-proclaimed coffee lovers who will drink any kind of coffee (from 3-in-1s to third wave blends) just to get my caffeine fix. And it’s not just the beverage that’s addictive. There’s coffee-flavored cake, ice cream, and even pork ribs. With this universal fuel ingrained in my system, I don’t think I can live without it. Especially with news of a growing disease that could wipe out the entire coffee industry. Coffee rust, the looming plague that’s been haunting Colombia since the 1960s, has the power to “cripple” the country’s national product. Colombia’s coffee exports are worth $2.4 billion as of 2016, making them the world’s third largest producer of coffee. In 1880, the Philippines was the fourth largest distributor of coffee until coffee rust and insect infestation destroyed almost all coffee trees in Batangas. When a tree becomes infected, the leaves produce a thin brown powder similar to iron rust. This disease is caused by the fungus Hemileia vastatrix, which also decolors bushes from green to brownish yellow. After, the tree will lose its leaves, including its ability to grow beans. Coffee connoisseurs know that coffee comes in two varieties: the Coffea arabica and Coffea canephora. The latter is also called robusta, a tougher tree that’s much cheaper to grow and crop. It’s not very appealing for most people because of its rough and bitter taste. 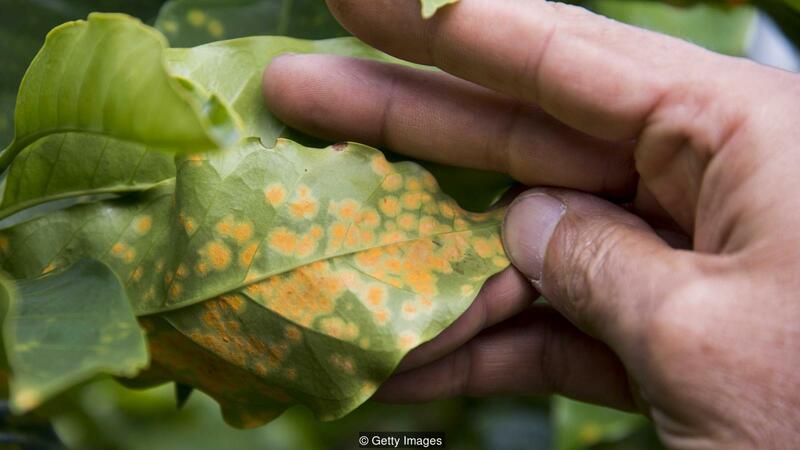 Unfortunately, coffee rust only attacks Coffea arabica—the delicate and delicious variety we’ve grown to love—because they lack the resistant genes that Coffea canephora has. Scientists and researchers are still working on a permanent solution to defeat the fungus, but they’ve already developed a hybrid where the beans retain the taste of arabica seeds with the robusta’s resistance. Currently, copper-based fungicides sprayed on crops every four to six weeks during the rainy season can prevent rust disease. If coffee rust spreads on a global scale, the people will be affected too. Colombia’s coffee industry employs 730,000 people and most come from deprived rural areas. If resources get cut short, imagine how much a 7-Eleven brew would cost by then.